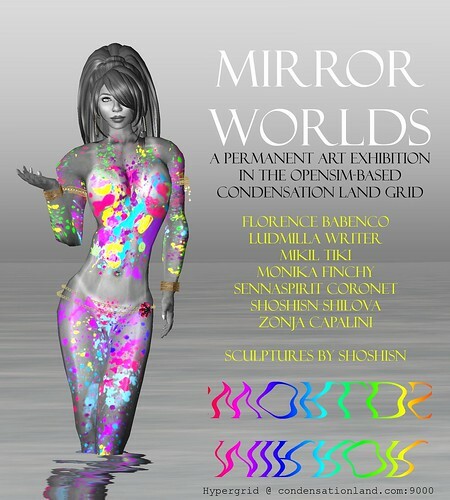 In this long overdue post, I introduce “Mirror Worlds”, an eternal (I will explain what I understand by ‘eternal’ in a minute) art exhibition located in the Opensim-based, hypergrid accesible, Condensation Land grid. 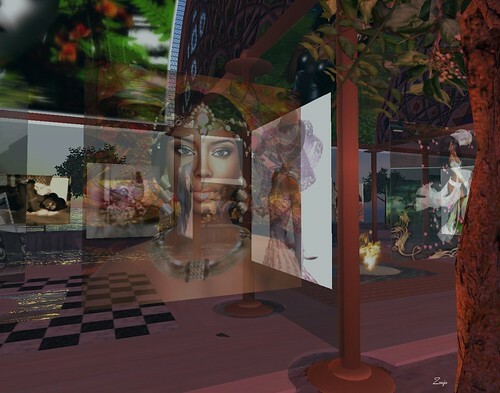 The exhibition features pictures from Florence Babenco, Monika Finchy, Shoshisn Shilova, and Senna (SennaSpirit) Coronet, and from the Condensation Land residents Ludmilla Writer, Mikil Tiki and myself. Shoshisn also has contributed several of her wonderful sculptures for the exhibition. In this post I’ll present the exhibition and explain some of its more unusual features. I’ll also describe some of the difficulties that I encountered in my work as an amateur curator — some of these difficulties may be due to my inexperience at the task, but I think that the other ones may help as a diagnosis of some problems the Opensim movement is facing. When I first though about making an exhibition in Condensation Land, I was thinking of setting up a permanent exhibition, i.e., one in which the artists changed and/or rotated with time. Soon I realized that virtual worlds technology allowed something more interesting: as artists changed, I could copy the old versions of the exhibition and put them in an airbox, so that visitors could come to look at the current version of the exhibition, but also teleport to the airboxes and see all the previous versions. That way, nothing would be lost, and we would have in fact, something new (and impossible IRL): an eternal exhibition. Now since (if we got enough artists willing to participate) I envisaged having to perform the cloning operation several times, I decided to develop an automated tool to assist in the cloning, and I developed the (admittedly hacky) tool I called Zoe — you can find a detailed description of the technical details in my post “Moving and rotating OARs“. Mirror Worlds is located in the southeast corner of the Condensation Land region in the Condensation Land grid. Aerial view of the 'Condensation Land' region. You can see the 'Mirror Worlds' exhibition in the southeast part, looking like an inverted 'L'. The exhibition has seven rooms, with works from (left-to right, bottom-to-top) shoshisn, myself, Ludmilla, Monika (at the corner), Mikil, Florence and Senna. Since Mirror Worlds has to be integrated in the landscape (i.e., the sim is not devoted only to the exhibition), I was confronted to the following problem: what should be the aspect of the exhibition from outside? I wanted the building to be as luminous as possible and have almost transparent walls — but then pictures, when seen from outside, would present a blank face, and this would have been very ugly. Since we are in a virtual world, we don’t have to be 100% realistic; I could have copied the textures to the back side of the pictures, but then there would be no reason to enter the exhibition. I solved this dilemma by copying the textures to the back of the pictures and making this side 50% transparent — this way, the exhibition is beautiful from outside, and what you see from outside invites you to enter and see more. Another decision was to also use the (cylindrical) ceiling as a place to also display pictures. You can see the results in the following shot, which shows a picture from Florence Babenco. You can visit Mirror Worlds by using the hypergrid: just go to an hypergrid-enabled region and teleport to condensationland.com:9000 — the Condensation Land grid is centered at 7789,7789. Building the exhibition, taking design decisions and solving technical/aesthetical dilemmas was the easy part of setting up Mirror Worlds — managing the human side of the problem was much more complicated. On the easy part, I first counted on two good old friends from the Second Life/Flickr community: Senna and Shoshisn. Senna has asked me to model several times and working with him has always been a pleasure. He’s a great friend and a very generous person — as soon as I asked him to participate, he gave me all his support and complete freedom to act. The current selection of pictures is mine, but he’s promised to make a new selection by himself, which will be featured in a coming edition of Mirror Worlds. Shoshisn is also a believer in the future of Opensim, and she has helped me to contact a number of other artists for their present or future inclusion in Mirror Worlds. One of these artists is Monika Finchy, whom I don’t know personally — Shoshisn introduced us and Monika kindly agreed to have her fantastic work displayed. Florence Babenco is an old Second Life friend. Florence, Ludmilla Writer and me made an exhibition in Second Life called “Las Tres Gracias” back in april 2008; for Ludmilla and me (but not for Florence) this was our first exhibition. When I asked her to participate, she immediately and generously agreed. Mikil Tiki is a great friend, the kind of person you need to have in a party to ensure its success, metamorph extraordinaire, and a resident of Condensation Land. She’s also one of the most intelligent persons I’ve never met in Second Life. Philosophizing with her about the virtues, defects and nuances in general of being virtual is a delight. She generously accepted to have her work exhibited in Mirror Worlds immediately after I asked her. Ludmilla Writer is my indefatigable RL friend, co-founder, contributor and resident of Condensation Land (she owns the Condensation Beach region), and co-owner with Favio Piek and me of Arrabal Tango Club. She’s helped me, in RL and in SL/Opensim, to think about Mirror Worlds, to prepare it, to select the pictures, and, in general, has given me moral support when I was finding the project too difficult. Without Ludmilla Mirror Worlds would not exist. It’s a pleasure to have her work shown there. 1) Many people mistake Opensim for Open Life. This is probably a result of the mass rush to Open Life that happened around the Openspace fiasco, and is a very bad thing, because of two things: first, because the performance and stability of Opensim at the moment was much worse than it is right now (but people are unaware of that); and second, because Open Life is anything but open, and the identification between Open Life and Opensim is bad for the Opensim movement. The net result is that they are lazy (i.e., refuse) to try (again) an Opensim grid. 2) Many people simply didn’t seem to understand what Opensim, or an Opensim-based grid, is. They seemed to think that I was talking about a special region of Second Life, or something like that. 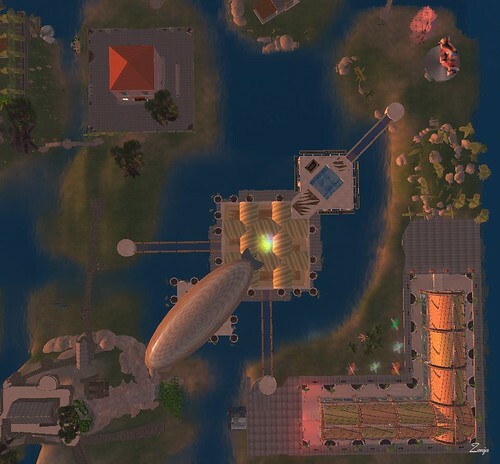 Awareness of Opensim between an important sector of SL residents is near to zero. 3) Between the people who do seem to understand what Opensim is, an important number found it too complicated to connect to a grid, even with my personal help and the presence of abundant documentation. This is specially problematic for Mac users, because of poorer support in general for Mac viewers. 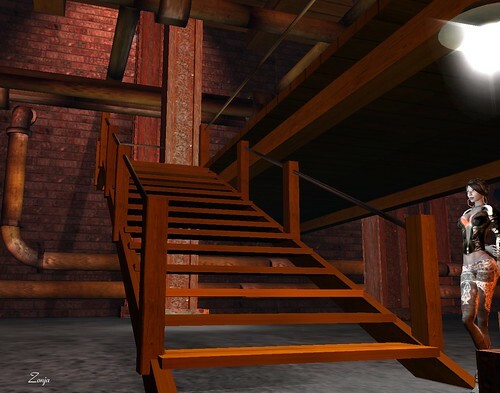 Many people who connect to SL routinely are artists or creative people in general, and they lack the skills to connect to Opensim. This is a problem because content creators and producers are much needed at the moment. 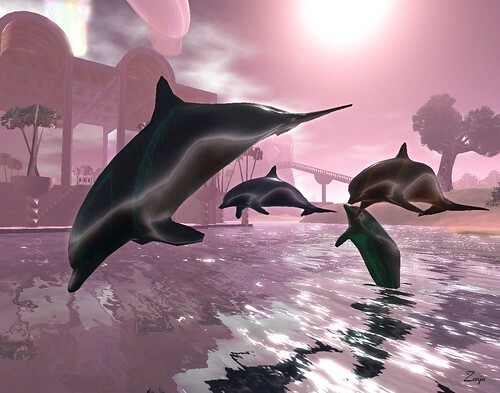 I mention these points here because Second Life has a rich, vibrant, artists community, and having this community to look with love to the Opensim grids, creating and showing their art in them, would be a very important bonus towards the general acceptance of Opensim as a platform. Even if it’s not part of the Mirror Worlds exhibition, I would like to mention that Breen Whitman has donated a copy of his wonderfully crafted “Eastern Gasworks” building; it’s being shown in the southeast part of the Condensation South region — if you visit Mirror Worlds, please take some time to take a look at this building. It’s amazingly detailed, with a lot of shadows baked in the textures. I’m very grateful to Breen for this fantastic gift. Finally, here‘s a very nice article (in Spanish) about Mirror Worlds, written by my friend Albert Revolution. Refleja tu gran trabajo, minuciosamente. Desde el punto de vista técnico y artístico, absolutamente prolijo y mostrando tu conocimiento extenso de la cuestión y desde el punto de vista humano con tanta sensibilidad y amor que da gusto leerlo. I read it all, it sums very well what you have been working on -well one part of in fact- these last two years. Tu gran trabajo as Ludmilla says. I am very proud you give so much of your attention to helping me find way in the maze. I may be curious and interested, but I get lost very easily. Thank you for the exaggerated praise, it was such a honour to have a few of my pictures exposed, especially alongside those made by artists I like very much myself, I certainly could not refuse my little contribution. The old picture of the award ceremony is one very dear to my heart, such a delicate precious present, I cannot express enough how grateful I am. We will go on exploring and trying out stuff, see how it all develops. I am not overtly mystical about the metaverse, it hangs on too many fragile threads, I expect some megacrash sooner or later. @Mikil: It’s always been a pleasure to help you, you give it all back in enthusiasm, and this is very good, because virtual landscapes, as avatars do btw, need love to flourish. You’re oh so right about the fragile threads, but maybe the megacrash can be avoided. I would not put so much work and energy in Condensation if I thought otherwise. I’m a photographer, a machinimatographer [Flickr, Youtube], an occasional blogger (also at Maxping, Rezzable), and an Opensim activist. I don’t do commission work — but if you ask nicely, I always love to help and cooperate :-) You can email me at zonja PUNKT capalini ATSIGN gmail DORT com.